Late night parties, nerve-exploding fire-crackers, the extreme human intelligence of shooting a nail-gun into the air at 3:00 am, followed by “Ow!…@$#%! Ow!” – it makes one want to get away from one’s neighbors. The ancient Gaels had a solution for that. The crannóg (pronounced CRANN-oak). It was a lake dwelling built upon an artificial island. Crannógs may have consisted of a few circular wattle-and-daub or stone houses, but probably not more than three. Many functioned as royal residences or places of refuge during raids, and were therefore surrounded by palisades or fences. Others functioned as workshops where smiths could work without fear of fire spreading throughout a settlement, and others were storehouses where valuables were kept safe. Some crannogs were approached by causeways or bridges, but for defensive purposes, most could only be reached by boat. According to O’Sullivan, crannógs ranged in size from 10-40 meters across, depending on the wealth of the occupant. “Building a crannog must have been a laborious, even a dangerous, task, requiring many weeks or months to gather together the raw materials and then put them in place. A large team of labourers working from dug-out boats or rafts could have first laid a substantial foundation of planks and cleft timber beams on the lakebed, anchoring them in place with vertical wooden piling. The crannog was then built up by depositing successive layers of peat, heather, brushwood, timber and stone onto the slowly rising surface of the mound. The sides…would have been retained by a wooden revetment or palisade driven down into the lakebed around the site.” (O’Sullivan, 2000, p. 16-17). Some archeological sites worth investigating include Moynagh Lough, Co. Meath, Lough-na-cranagh on Fair Head, Co. Antrim, and Lough Meelagh, Co. Roscommon. Most crannógs were occupied between 500 and 1200 AD, and there are some marvelous reconstructions you can visit. The crannóg mentioned in Ripples in the Rockpools, where Conall spends his early childhood, is the one on Fair Head. Although it’s a ruin now, it’s still accessible to tourists – and what a view! O’Sullivan, A. (2000). 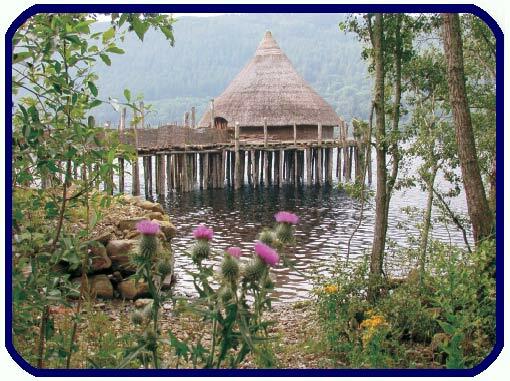 Crannogs: lake-dwellings of early Ireland. Dublin: Country House. Ok, I don’t know why the creator chose Nocturne No. 19 In E Minor, Op. 72, No. 1 as accompanying music to this video (there are many Irish harp arrangements in the public domain! ), but the cinematography is wonderful. You get a good look around inside the reconstructed crannog (and Bunratty Castle nearby, built in the 16th century). In the castle part of the video, you can see a bedbox (mentioned in the Harplord Chronicles). The Scottish Crannog Centre Kenmore, Loch Tay, Aberfeldy, Perthshire, Scotland. This entry was posted in Archaeology, Housing and tagged archaeology, crannog, houses, Ireland. Bookmark the permalink. Once again, you have shown me something I did not know exsisted. The crannóg looks very similar what can be seen on some South Pacific islands. The links at the end of the blog were great and I had a mini-vacation (while still at work on a Friday). Great fun.